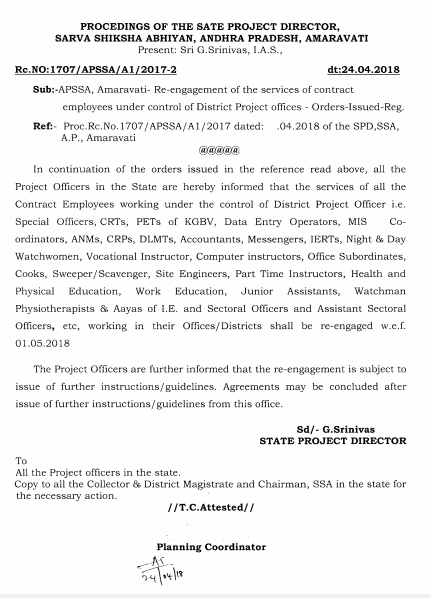 As per RC No 1707, all the Project Officers in the State are hereby informed that the services of all the Contract Employees working under the control of District Project Officer i.e. Special Officers, CRTs, PETs of KGBV, Data Entry Operators, MIS Coordinators, ANMs, CRPs, DLMTs, Accountants, Messengers, IERTs, Night & Day Watch women, Vocational Instructor, Computer instructors, Office Subordinates, Cooks, Sweeper/ Scavenger, Site Engineers, Part Time Instructors, Health and Physical Education, Work Education, Junior Assistants, Watchman Physiotherapists & Aayas of I.E. and Sectoral Officers and Assistant Sectoral Officers, etc, working in their Offices/Districts shall be re-engaged w.e.f. 01 .05.2018. The Project Officers are further informed that the re-engagement is subject to issue of further instructions/guidelines. Agreements may be concluded after issue of further instructions/guidelines from this office.